Many of today’s conventional cleaning products are packed with chemicals that, according to numerous experts, may pose a risk not only to the environment but also to human health. Yet such products have become household names. People have grown up with these cleaners stashed under the sink or in a cleaning cupboard, and their familiarity can make switching to new products difficult. 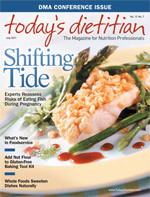 But the dietitians interviewed for this article believe that incorporating greener cleaning products and techniques that are effective without posing potentially harmful side effects is an important consideration not only for consumers in the home but also for dietitians and other professionals in the foodservice arena. Estimates from sources such as Discovery Channel’s PlanetGreen.com indicate that 5 billion pounds of chemicals are used in the institutional cleaning industry each year. If your foodservice kitchen isn’t cleaning green, you may want to consider advocating for this change to benefit the health of both people and the environment. Whether in the foodservice department at schools, hotels, hospitals, or other healthcare settings, making the switch to green cleaning has the potential to positively impact many people. “One of the important reasons to switch is that environmental toxins and chemicals used in cleaning products wind up impacting what our food touches, what’s on our hands, and even what’s in our air,” says Stacia Clinton, RD, LDN, of Health Care Without Harm, a global nonprofit organization that is working toward more ecologically sound and healthful alternatives to healthcare practices. The fact that these cleaning products may come in contact with food makes it increasingly important to ensure the chemicals being used in any foodservice department are safe. While it would seem that switching to green products is a no-brainer, making the change is not necessarily simple. One of the key difficulties in switching to greener products in foodservice is that there are often strict protocols to follow. It’s much easier for consumers to employ green cleaning habits at home where there aren’t so many rules and regulations. Although she says there are standards to uphold and homemade solutions using natural products such as baking soda won’t cut it, Thorne is a big advocate of greener cleaning. She says the biggest reason to consider using greener and safer cleaning products is health related. But Clinton says there are innovative techniques being employed in the foodservice industry. Electrolyzed water, for example, is being used as an antibacterial in place of chemicals. What’s been called “miracle water” in the media is actually a simple mixture of salt and water whose ions have been scrambled with an electric current, resulting in what’s called electrolyzed water. This water has been used for years in Japan but is just catching on in the United States. The machine used to electrolyze water isn’t cheap, and Clinton says it may require periodic maintenance to ensure it’s working properly. But she believes the savings over time can be much greater than buying traditional cleaners. In addition, the value of replacing potentially harmful chemicals with a safe water-based solution may be worth much more than the physical price tag. To get their organization started with greener cleaning, foodservice personnel should have a more open dialogue about the types of products and chemicals being used in their facility. Clinton says education is also vital.